I thought since the last installment of Harry Potter opens at midnight that I would feature a little bit about the boy wizard’s world of food. The imagined world that JK Rowling created is full of real and magical culinary treats from butterbeer and pumpkin pasties to Bertie Bott’s Every Flavored Bean and Chocolate Frogs. An internet search reveals that there are millions of websites and blogs dedicated to the recipes and foods that Harry, Ron and Hermione enjoy through their fictional journey. Big name companies like Universal and Jelly Belly have even jumped on board to help create a world of magic for Muggles around the world to immerse themselves in the wizarding world. Here are some of my favorites that have my stomach growling and gearing up to enjoy “Harry Potter and The Deathly Hallows – Pt. 1” tonight! The chocolate frog. As seen in the first Harry Potter movie, these chocolate treats include a collectible holographic image of a famous witch or wizard. The centers are crisped rice. However, I don’t think you need to worry about these little amphibians jumping off the Hogwarts Express. 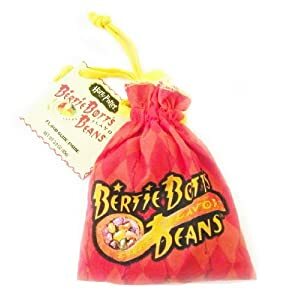 Bertie Bott’s Every Flavored Bean. Jelly Belly came up with these wild and disgusting jelly beans. With flavors like booger, ear wax and vomit, you’ll wonder why Dumbledore enjoyed these so much. I must admit after trying a vomit-flavored bean once I was completely thrown off from ever trying these again. Who at Jelly Belly actually had to be the tester for these things? “Hmm, that doesn’t really taste like vomit. I think we need to add a little something else.” I want a lot of food jobs, but not that one. Also, I’m not sure Jelly Belly still manufactures these anymore. Their website now sells what are called “BeanBoozled,” weird and nasty flavors mixed with regular Jelly Bellies. Three Broomsticks at the Wizarding World of Harry Potter. Why not eat where all great wizards dine while in Hogsmeade at Universal Orlando’s Wizarding World of Harry Potter. Enjoy butterbeer along with other favorites like cornish pasties (flaky pastry filled with ground beef, veggies and potatoes), rotisserie chicken, ribs, Shepherd’s Pie, and fish and chips. The quick service restaurant is large and designed in a gothic manner with little embellishments like broom holders. While in Hogsmeade, you can also check out the Hog’s Head, a pub that in the books is owned by Albus Dumbledore’s brother, Aberforth. Perhaps one of the best blogs that I came across (if not merely for the name alone) is Dumbledore’s Vegan Army. While small, the blog has some good recipes for Hagrid’s Rock Hard Cake, Professor Slughorn’s crystallized pineapple and Dark Mark Cookies. Finally, here’s a recipe to keep you hydrated. For the adult version add: 1 shot per serving of Apple Brandy. Melt the tablespoon of butter in a medium cauldron on medium heat. Add the cider, mulling spices and caramel. Stir frequently or the caramels will stick. Cook until the caramel is melted. Strain through a mesh strainer. If you want to enjoy your butterbeer cold, let the mixture cool, then add the bottle of cream soda right before serving. If you want it hot, add the cream soda to the pot and heat until warm. For adults, add a shot of apple brandy in the glass before adding the butterbeer. This entry was posted in Food - General, Foodie Destination, Recipes and tagged Albus Dumbledore, Bertie Bott's Every Flavored Bean, butterbeer, chicken, Chocolate Frogs, cornish pasties, Dumbledore's Vegan Army, fish and chips, Gryffindor, Harry Potter, Harry Potter and the Deathly Hallows, Hermione Granger, Hogwarts, Jelly Belly, JK Rowling, recipe, ribs, Ron Weasley, Shepherd's Pie, Sprecher, The Go Lightly Gourmet, Universal Orlando by Christina. Bookmark the permalink.